While the French are invited to focus on the bad vaudeville, which is the settlement of scores between his former partner and pathetic Hollande, he is going down in front of the dictates of Washington. But no more, as the other Europeans "leaders" (what do they manage? ), as spineless as him. We will definitely seen it all, with these socialists (or supposedly) that claim to give moral lessons to everyone: a Secretary of State for Foreign Trade, Thévenoud Thomas, who does not pay his taxes while the state fiscal condition have decreased since the late of July, of about 6.3 billion euros. This decline might be due to the reduction of the amounts received under the corporate income tax, this following the entry into force of the tax credit for competitive employment (CICE: ‘Competitivité et emploi’), a gift from Holland-Valls to the MEDEF. On the other hand, of course, the amount of effort required from taxpayers fall away, as anyone can see on his tax form. Icing on the cake, Thévenoud "forgot" to pay his rent for years. And of course he intends to retain his seat as a Congressman, because the ‘soup is good’. It applies the motto of an average politico: lower, lower and lower. Do they still really wonder about the gloominess of citizens? Meanwhile, serious things are happening elsewhere. For example, Portugal is a country which has the misfortune of being a testing ground for the neoliberal claim that guide the destiny of the world, especially countries in difficulty. He is showing, to some governments which in fact govern nothing, how to behave. That is, the Portuguese "government" announced on September 5th having sold, to institutional investors, the 31.5% it still held in the CTT postal group. This operation is part of privations negotiated in May 2011, with the European Union and the International Monetary Fund, in "exchange" for financial support of 78 billion euros. In fact, the Portuguese State has agreed to sell its right of control on the postal system, i.e. a part of its sovereignty. Postal workers from other countries, including France, had to worry about it because the nationalist intimidation will not stop at the borders of Portugal, especially as the "experts" tell us that the Brussels notion of border is now obsolete. The Chinese are smiling. They maintain their ambitions on the world economic markets. They pretend a place among the group of major industrial countries of the atom: apart from a national program, which aim of improving the capacity of power station on their territory by 2020, they intend to sell overseas Chinese expertise, because of a 100% reactor. At the same time, the Chinese e-commerce leader Alibaba (sic) performs a New York stock exchange listing, which will be the most important entrance in history. He hopes, with ease, to conquer the world. As soon as he understands that the creation of a website dedicated to Chinese companies, which are eager to introduce their products to foreign buyers corresponded to a critical stage of the Chinese economic growth, its founder Jack Ma (real name My Yum) conducted a breathtakingly high growth. The group created by Jack Ma displays an impressive success. Its turnover reached, for the year 2013-2014, 52.5 billion yuan (6.5 billion euros), up 52% after surging in the previous year, of about 72%. The business volume traded on its platforms reached 208 billion euros. Alibaba earn more money as Amazon and eBay combined ... The holding company controls a multitude of companies, all Chinese, corresponding to different jobs. Talk about this and that. We keep saying this since a long time, without tiring: immigration is the most dramatic challenge France and Europe are facing. The Financial Times recently admitted that Italy has recorded, in late August, an absolute record of 100,000 illegal immigrants a year. In front of this breaker wave, even Le Monde must recognize (10 September): "We must tell the truth (...) The European Union is the territory that hosts more migrants in the world. The growth of illegal immigration reached tremendous levels." But "the issue is not a priority for the European Union (....). It spends less than 1% of its budget to this central question in life about the immigration. The result is disastrous”. So what to do? Le Monde gives an answer worthy of him: "Stop illegal immigration is not easy for everyone." False. We know, us, that it is, in fact, a question of political desire and courage, freed from taboos. Furthermore, the European ‘house’ is threatened by fire. While the crazy of Allah keep recruiting in "sensitive areas" of French cities (as in other European countries), they develop their settlements in both Africa and Asia. Their recruits, which are holding a passport from a European country, are young, motivated as to be ready for anything. The worst abomination, far from discouraged these nutcase, excite them and they stimulate themselves through videos, showing how a man is decapitated with a butcher knife. While the Washington-Tel Aviv axis believes we can break this momentum with cannon, tanks and bombers, Europeans discovered with shock the reality: the sadistic barbarism is not in front of their door, it is already in their home. They also discover the inconsistency, the poorness of politicians, left and right, supposed to assume responsibilities at the highest level when they are in fact powerless, irresponsible, incompetent, unconscious, sold. The weight of realities is, in fact, days after days, making its way into consciousness. Bitterness and anger accumulate. When is the spark that set fire to the plains? Without being a soothsayer, we are confident that the hour approaches. Those who want to survive should have this in mind. One hope: the affirmation of carnal motherlands. Scotsman (failure of independence is only temporary) and Catalans (they were 1.8 million to sing ‘Els Segadors’, their national anthem in the streets of Barcelona on September 11th) are leading the way. Others will follow. 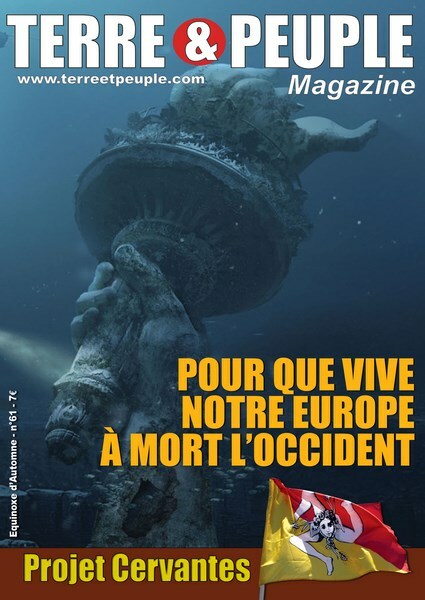 N°61, Pour que vive notre Europe, à mort l'Occident, équinoxe d'automne 2014.
p.3, Pierre VIAL, Avis de Tempête, éditorial. p.4, Deniers du cul(te) : l'évêque et les homos. p.4, Meilleur des mondes, Délires. p.5, Femmes allemandes, Histoire, intox et vérités déplaisantes. p.5, Allah, la, la ! Le ventre fécond du jihadisme. p.6, Najat Vallaud-Belkacem, pauvre petite fille marocaine. p.6, Déficit : Moscovici larbin zélé. p.6, Soldes papales. Vatican : des sous, des sous. p.7, Fondations Brigitte Bardot. Brigitte Bardot mère courage. p.7, Boone économique. A quel saint (ou sein) se vouer ? p.7, Cisjordanie : vol de terres. p.8, SYLVIE, Les fourneaux d'Epona : caille aux raisins, la caille. pp. 9 à 12, Didier CARETTE, Artistes ou parasites ? Réponse au ravi de la crèche. p.13, Pierre VIAL, Pour que vive notre Europe, à mort l'Occident (dossier). pp. 14 à 16, Pierre VIAL, Le chancre occidental. pp. 17 à 22, Alain CAGNAT, Les vices cachés de la construction européenne. pp. 23 à 27, Roberto FIORINI, L'Euro est un poison mortel. pp. 28 à 33, Robert DRAGAN, Ex oriente lux ? Un Chinois résume trois siècles de notre Histoire économique. pp. 35 à 43, Claude VALSARDIEU, Racines et rhizomes du monde blanc. pp. 44 à 47, Robert DRAGAN, Ecrans de fumée (2). p. 48, La roue et le sablier (Pierre-Emile Blairon). p. 48, Révolution conservatrice (Robert Steuckers). 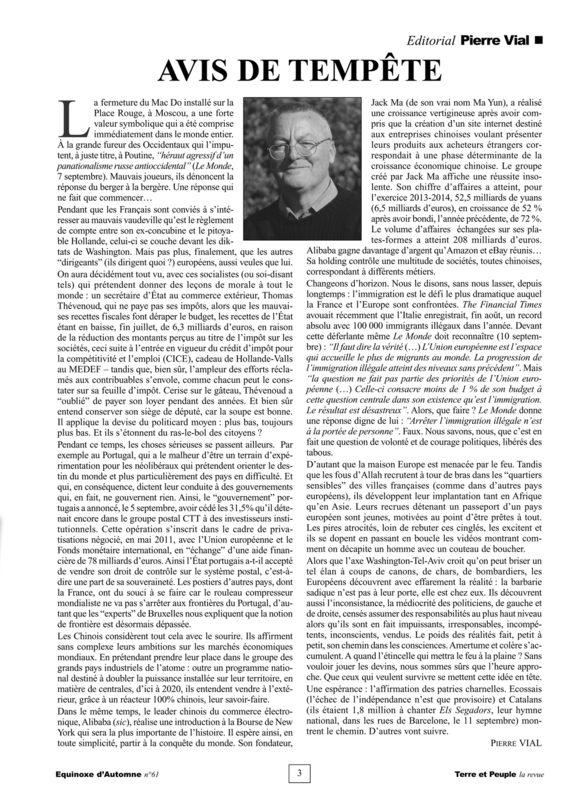 p. 48, Encore et toujours Céline (Le bulletin célinien de Marc Laudelout). p. 49, Héritages indo-européens dans la Rome républicaine (Valéry Raydon). p. 49, Les Germains (Nouvelle Ecole n°63-64). p. 50, 1944, l'été chaud des collabos (Olivier Pigorneau). p. 50, Breslau, une forteresse imprenable (Jacques Bressler). p. 50,La grande aventure des dieux du Walhalla (Claude Weber). p. 51, Religiosité indo-européenne (Hans F.K. Günther). pp. 51-52, XIXe Table Ronde de Terre et Peuple (Reconquête hier, aujourd'hui, demain).